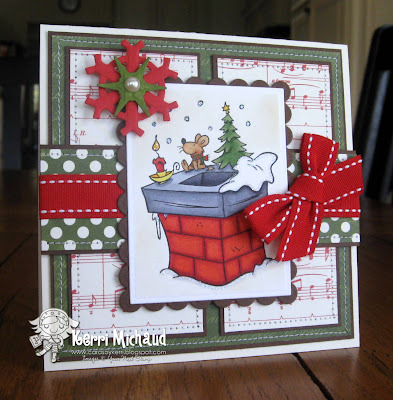 Your Next Stamp New Release Christmas Blog Hop! Hello! 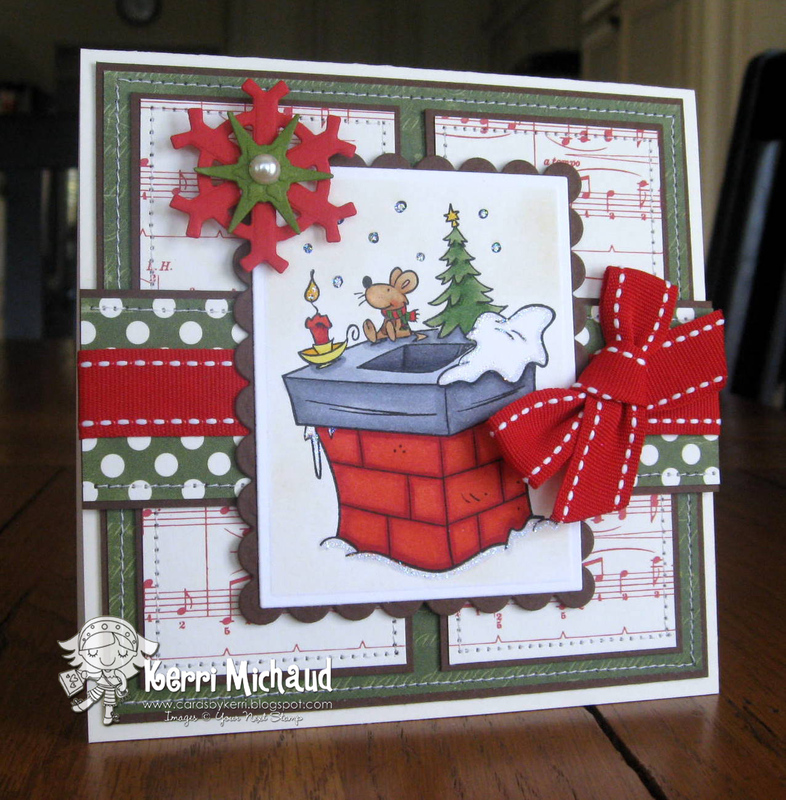 Welcome to the Your Next Stamp New Release Christmas Blog Hop!!! We have some adorable new images to show you today, plus we have a few special guests joining us on this hop! We have 4 random prizes hidden along the hop, so make sure you leave comments along the way! One of those prizes is a grand prize new release stamp package!!! How awesome is that!?! 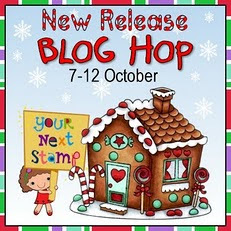 Now it's time to head on over to another special blog hop guest~Angela Wood's AMAZING blog! Trust me, you don't want to miss her coloring skills! After you finish the hop, make sure you stop by the YNS Store where Karen is offering 15% off your purchase! Thank you so much for stopping by, and have a wonderful day! Kerri I love your SWEET projects. I LOVE the hot cocoa holder, those stamps are just the cutest!! I so love both of your projects Kerri!! Your little hot chocolate holder is darling!! So fun and creative!! The card with the chimney image is stunning!! Such a cute image and your coloring, layout and dp rocks!! The mouse and mug images are so cute - well ALL the YNS images are cute. I like your little hot chocolate packet creation too. Will have to pick up that freebie from My Time - thanks for the heads up Kerri! Oh the hot cocoa pouch is cute!! That would be fun to mass produce and hand out to kids. Not sure how hard it is - but I might have to download it and give it a shot because you said it was FREEEEEEEEEEEEE! Very cute! These images are soooo fun! Beautiful card - I really like the overall design. The hot chocolate container is so cute and would make a great little gift for teachers or co-workers. So lovely projects Kerri. The cocoa pouch is very cute! Wow Kerri!Your set is awesome!I love it!Simply stunning!Awesome! So cute!!! I love this mouse stamp. Great job! The little mugs are perfect for all kinds of projects! 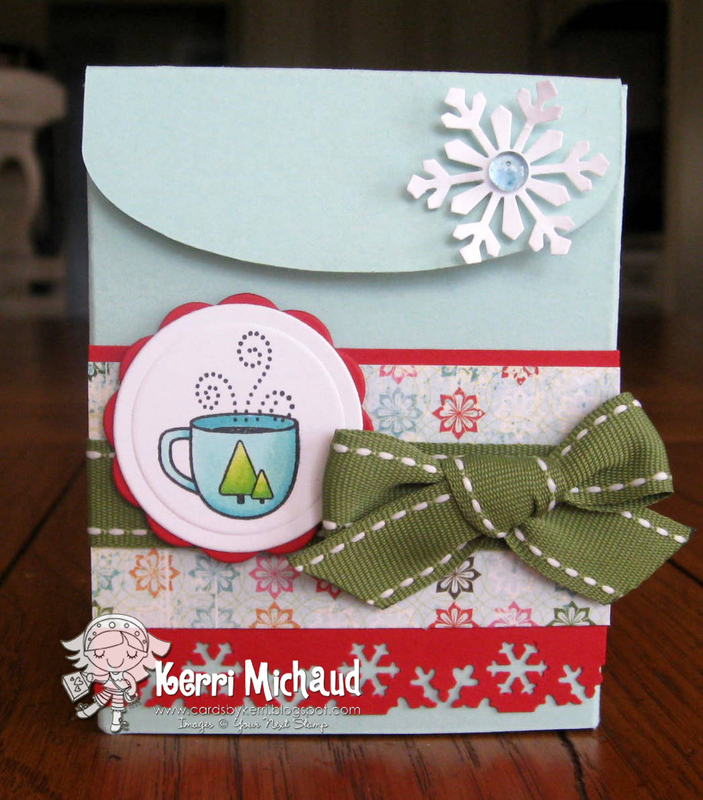 Kerri these are sooooo darling, LOVE your mouse card and your fun cocoa project!!!! AWESOME GF! That little mouse is so darling!! And all of the details on your card are just perfect! I also LOVE that hot chocolate holder!! The cozy little mug is super sweet! As always, nice, do-able projects. I appreciate that! Cute projects! I love the cocoa pouch. Love your merry mouse eve and mug stamp projects. seriously cute projects! I love that little mug! I LOVE how you made this card. You are so creative!!! Eeek! This is so cute! Love the little box--I have it too and have never used it. Love the hot chocolate packaging! ACK... How stinkin cute is this. I just adore that image, how fun! The hot chocolate pkg is a great gift idea and looks yummy! Simply adorable! 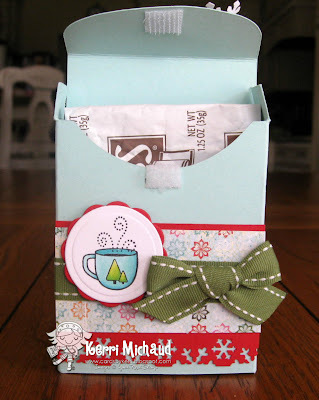 Love the idea of a little hot chocolate envelope! The mouse is adorable and always looking for ideas for the little mugs!Thanks! Cute projects--I especially like the Hot Chocolate box. Kerri, what ADORABLE projects! I absolutely love the little mouse on the chimney, and the little mug of hot cocoa! Your copic coloring is also fantastic! Thanks for sharing! Adorable Christmas projects! Love the little mouse! And what a cute cocoa package gift!